In Seabrook, Texas, while gazing at the view of multiple yachts, wild birds and palm trees in the breeze, it takes the start-up of a small submersible mixer to bring one back to reality that they actually are at a site that is handling sewage. In sunny Seabrook, just 30 minutes south of Houston, this small town on Galveston Bay can boast one of the world’s most pleasant wastewater treatment centers—a facility that has proven it pays to plan ahead through clever design. For example, when the Category 4 Hurricane Harvey devastated much of the low-lying grounds in southeast Texas, the Seabrook Wastewater Treatment Plant (WWTP) kept operating. The electrical controls were all mounted above the high-water mark in anticipation that one day floodwaters would infiltrate the plant. 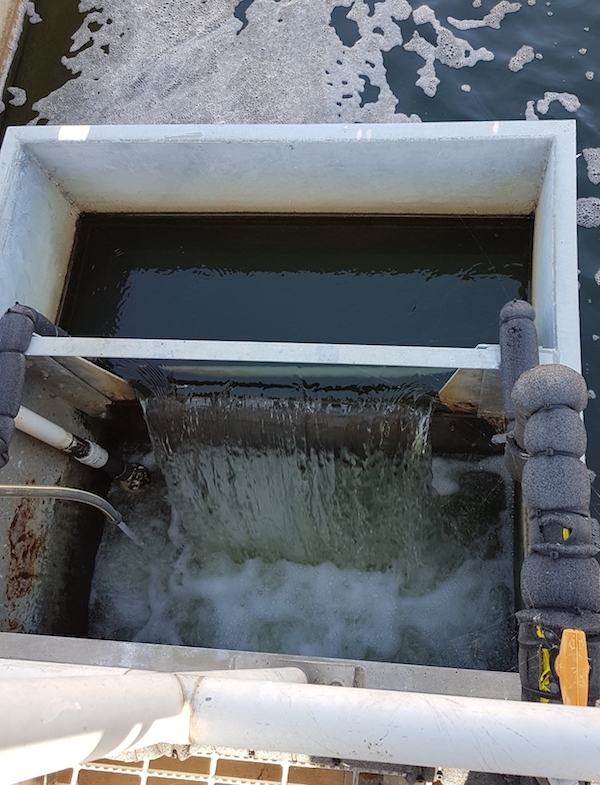 The submersible mixer in question plays a key role in the Seabrook WWTP being a good neighbor, especially with many waterfront properties close by in the vibrant yet relaxed area that feels more like a resort-style experience. Seabrook’s Site Superintendent Rafael Gonzales said the submersible mixer from Landia is doing its job in helping to control odors. According to Gonzales, the plant is at the mercy of the dewatering process happening every three to four weeks because the sludge haulers want to do everything as fast as possible. “This puts us under pressure. We may not have to run our belt process, but we do have to be very aware of odors escaping,” Gonzales said. Located 10 minutes from the National Aeronautics and Space Administration’s Johnson Space Center, the mixing process at Seabrook’s 2-million-gal-per-day plant had become complicated and at times labor-intensive until the Landia mixer was installed almost two years ago. The Seabrook wastewater treatment plant kept operating even in the midst of Hurricane Harvey. The previous mixer, a direct-drive model, kept tripping out. On six separate occasions, Gonzales and his team had to remove it from the water for repairs. “Try as we might, moisture had gradually crept into the mixer, ultimately leading to a complete burn out, so we needed to find a good, sturdy replacement,” Gonzales said. “We could have asked for another direct-drive mixer, but by discussing our needs with Landia and reviewing the application, their recommendation was that a gear-driven mixer would be much better for us, and so it has proved. We also saved money straight away by them being able to use the existing guide rail for the retrofit. There was no need to drain the tank”. At this 1960s-built plant located close to the third largest boating center in the U.S., the switch from a direct-drive mixer to a gear-driven mixer raises an important and often overlooked issue. In the case of Seabrook, a gear-driven mixer was more suitable for its sludge tank than the direct-drive mixer that they previously had been sold. Use of certain direct-drive mixers can become costly in operation and repair costs. A direct-drive mixer means the propeller rotates at the same speed as the motor shaft, up to 1,800 rpm. But at that velocity, a great deal of disruption and damage would be made to the biological process. Savage added that without the benefit of a gear reducer, slowing down the propeller speed is done in other ways. This typically is done by increasing the number of poles in the motor. Unfortunately, this adds a lot of weight and reduces the motor efficiency. According to Gonzales, the Landia gear-driven mixer is run for an hour or two per day with no problems. “For its performance and reliability, we can see that it’s just right for the application,” Gonzales said. “The mixing pattern is good, and with an adjustable guide pipe, we can also use it during dewatering to push the solids over in the right direction. We’re very happy with it.